I think it's fairly well-established that bananas (much like chickpeas and cauliflower) are something of a magical ingredient. A banana, along with a handful of nuts, is my regular late-morning snack of choice but, as we know, they can be used for so much more. These pancakes are another example. I first caught sight of these 3-ingredient pancakes via Cooking Light's instagram feed and then I saw it again in the latest issue of the magazine. As you can imagine, there's room for add-in's if you're inclined to take it beyond the three ingredients. I couldn't resist a splash of vanilla extract. Stirring in some spices, or maybe even incorporating a spoonful of peanut or almond butter, could be good ideas. But very simply, you just need (1) a ripe banana, (2) a couple tablespoons of whole wheat flour, and (3) an egg to make these pancakes. So no baking powder/soda, or melted butter, or sugar. Since I make pancakes often, and have bananas on the ready at home at all times, it was easy to give these a try. These pancakes turn out moist and sweet, a fun change on the usual fluffy pancakes. I didn't quite believe it at first but as the magazine describes, they are very much like the custardy center of a French toast. If you like that texture as well as bananas, this is something to try. This recipe makes 3 pancakes that you see here, perfect for a protein-packed breakfast for one. I topped mine with maple syrup and a sprinkle of toasted walnuts. I recommend some kind of topping, crunchy or fruity, as a nice way to add a little contrast and texture to these soft, custardy pancakes. I can tell you that a slice of savory bacon on the side also works quite well. I am feeling slightly seasonal today. It's rather unusual because, with me, it's mostly chocolate all-year round when it comes to baking treats. Chocolate's my "season". 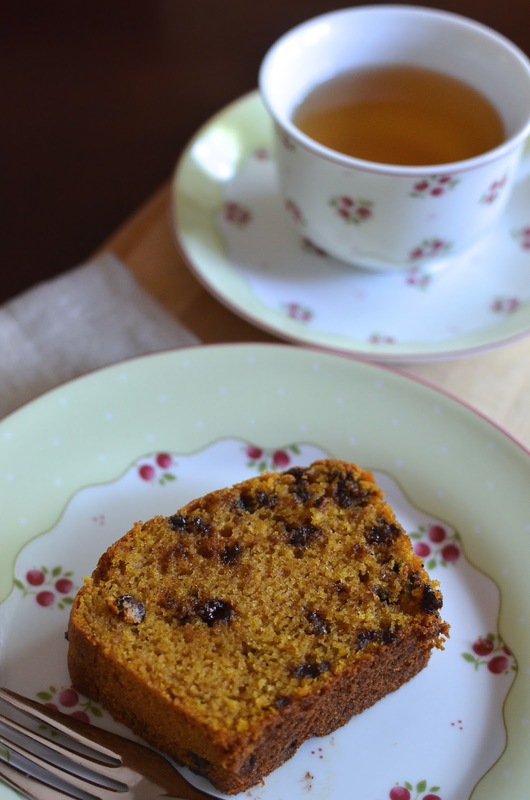 But I had an urge to bake with pumpkin - something simple and warming, which had me thinking of a loaf cake. So without further ado, here's the pumpkin-chocolate chip loaf cake I baked up the other day. I decided to split the batter among 3 smaller loaf pans and share a couple of my mini loaves. It's a great way to spread a little Fall cheer around. And I was very happy with the result of this bake - I ended up with a moist cake (not dry and dense, like I sometimes fear with loaf cakes/breads like these) with a good dose of spice and a nice helping of chocolate sweetness from miniature chocolate chips floating throughout. You know I had to pick a recipe with chocolate! Incidentally, today is the first day of Fall! This is definitely the fun part of the changing seasons...when the temperatures and colors around you start to change, and your taste buds start to change with it. You see pumpkins, squashes, and root vegetables taking over, and you find yourself craving winter spices. And speaking of spices, I didn't have the pumpkin pie spice called for in this recipe and I didn't want to buy it so I used what I had on hand, which ended up being a mixture of cinnamon, nutmeg, ginger, and cloves. I had plenty of warm spice flavors from that mix. That's how I look at it because, for some reason, Baked Alaska is one of those things I've always wanted to make! 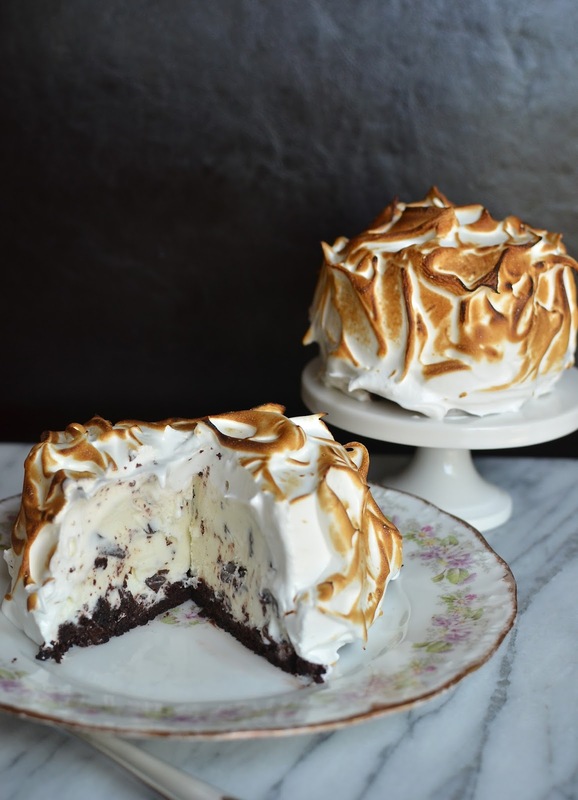 I'm really not sure why - maybe it's just the presence of ice cream that I always want to eat but there's something special about a Baked Alaska, an element of surprise. When I first got my little kitchen blow torch last Christmas, I knew I'd eventually make my way to this dessert. It feels good to finally have a go at it! I made these as our "back to school" cake(s) this year. Celebrating the first day back to school is a great reason to make and eat cake! I am very lucky - and grateful - that my husband was home to help me photograph these torched mounds of ice cream cake! With hands sticky with meringue and thoughts of melting ice cream, it was a luxury to have a helper snap some pics for me. He is such a good sport to go along with this hobby of mine. I pay him back with dessert, and he seems happy with this arrangement. 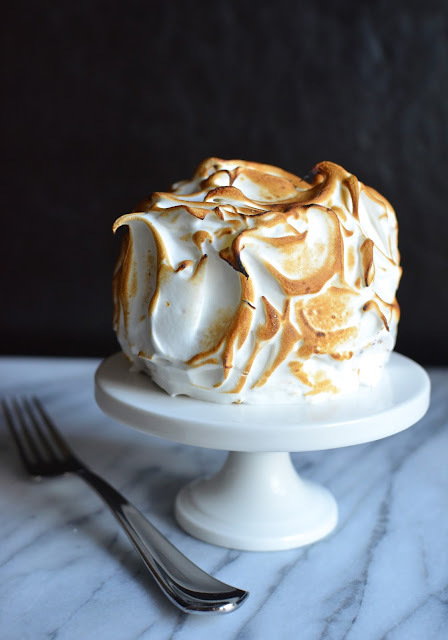 A Baked Alaska is basically an ice cream cake encased in a snowy, billowy mound of torched meringue. It's fascinating to look at, fun to cut into, and delicious to eat! It takes a few steps to make but you can do it ahead and try to keep it as simple as possible. I'm giving my ice cream maker a well-deserved break and used store-bought ice cream. I started by making a chocolate cake base, scaling down this recipe from Martha. I really love the idea of neapolitan flavors in a Baked Alaska but instead of trying to make layers in my small Alaskas, I went with mint chocolate chip ice cream and just one base layer of cake at the bottom (you could alternate layers of cake and ice cream if you want). This chocolate cake recipe is perfect for ice cream cake - so moist and since it's made with oil, it doesn't harden like a rock in the freezer. I used small glass prep bowls to make my mini Baked Alaskas and you could use anything from teacups to bowls or a cake mold. Or make one large Baked Alaska instead. Just spray the bowl with cooking spray and line it with plastic wrap, leaving plenty of overhang. Then pack in a good-quality, creamy, dense ice cream before sealing it with the cake layer that will become the bottom. It's easy to take the chocolate sponge cake you've baked and cut out the size you need by inverting the cup or bowl you're using for the mold and cutting out the rounds you need. This can (and should be) assembled ahead and kept in the freezer until show time - when you make the meringue, apply it liberally onto the frozen, molded cakes, and torch it! I coated the cakes with a thick layer (insulation, really...) of Swiss meringue before giving it a quick, thorough pass with the kitchen blow torch. You can actually bake the cakes in a very hot oven but I think the blow torch is very quick and effective here. In an instant, you achieve beautiful-to-look-at as well as delicious peaks of toasted meringue. I'm happy I finally got to make my Baked Alaska. It's most definitely a very special treat. There was an unexpected perk to our vacation down at Miami Beach a few weeks ago...I discovered the deliciousness of Cuban food! We had a great trip and ate very well, which always makes a trip even better. My favorite thing was learning more about Cuban food and tasting some of the specialities. The first day we arrived, we caught a cab over to Versailles Restaurant, "the world's most famous Cuban restaurant" located in Little Havana, for lunch. While my husband often goes out for Cuban food for lunch with his coworkers in NYC, I was hardly familiar with the cuisine. I'm now a big fan. Cuban food is really delicious - comforting and packed with flavor without being overly spicy. So we sampled things our friends told us we must - dishes like "vaca fritta" and "ropa viaja". We had sides of moros rice and plaintains. It was a filling meal capped off with tres leche cake (my first!) and teeny cups of cafe Cubano (super-strong, yet very sweet, espresso). Among everything that we ate, one very simple thing stood out: this amazingly delicious white rice, or "arroz blanco". The simple white rice steals the show...never mind the roasted BBQ chicken or bean salad I served with dinner! We were struck by how this plain-looking white rice that came with many of our dishes had so much flavor - slightly garlicky and very savory. Even the little guy couldn't praise it enough and since he's hardly a rice/carb lover, it's unusual. We had Cuban food a few more times at other places and each time, the arroz blanco was consistently delicious. I knew the shiny white rice had to be cooked in some oil and garlic. I couldn't really detect any particular spice. Luckily, I found out this rice is very simple to make and recipes are pretty consistent. So yes, this post is just about this simple white rice - we won't even talk about the roasted BBQ drumsticks or bean salad I served with it for dinner because the rice was everyone's favorite part of the meal! The only thing I will say is don't cover the rice with gravy or a heavy sauce because it's so flavorful on its own that you want to be able to taste it separately. The recipe, which I found in The Cuban Table, is simple enough. It starts with warming up a couple tablespoons of olive oil and adding a few mashed garlic cloves. Let the garlic infuse the oil with its flavor for about 2-3 minutes, then remove it. Carefully add hot water, a generous amount of salt, and a bay leaf before finally adding the rice. I think you will be amazed by how tasty a rice you end up with in about half an hour! If you're like us, maybe brown rice has become more the staple in your house when it comes to eating rice. Even if that's the case, I urge you to give this a try...it's that tasty. No doubt about it, these little French tea cakes, known as financiers, are one of my all-time favorite treats. My husband and I just adore them and they are my favorite ways to use up egg whites. Since I've been making plenty of ice cream this summer, I've had the chance to whip up a few batches. This might be getting old...I've talked about this a lot! I know it and I just can't help it. I've taken the original financier recipe and made hazelnut, pistachio, and matcha versions. I usually stick with the original but since I make these often enough, it's fun to change it up a little. Basically, I'll make any excuse to make, eat, and post about these darling little cakes! This time, I made a batch using cashew nuts. At the very basic level, financiers are super moist sponge cakes made here with browned butter, egg whites, sugar, ground nuts (normally almonds but you can vary this like I do, this time with cashews) and a little flour. I'm telling you, the result is magical! It's nutty, it's super moist and tender, and full of this amazing brown butter flavor. We adore cashews. Growing up, my mother fried cashews for a chicken and cashew stir-fry dish that was, and still is, a family favorite. I cook with it myself at home and it's a favorite nut to snack on (I used to keep just almonds on hand for snacking but in the past year, I started roasting batches of mixed nuts and keeping a jar on hand...everyone digs for the cashews!). Lately, I've been thinking it would be fun to incorporate cashews a bit more into my baking. The funny thing is, in this case, these cashew financiers don't taste all that different from the standard ones made with ground almonds. In other words, they turned out utterly delicious! I often tuck a little chestnut cream (my stash of which has been replenished thanks to my sister hauling back several cans for me from her vacation in Europe) into our financiers and that is incredible! This time, I put a little peach jam into one - you can use any kind of jam or even plop a piece of fruit inside. And you see that runny center there? Here's the thing - it's a little under-baked, on purpose. Peach jam inside...and an under-baked center, which I do often because it's really tasty! We think that a gooey center, where the batter isn't quite baked through, is the best part (that and the crisp edges)! It's very much like under-baking brownies or cookies for that soft, gooey center. Maybe you wouldn't want to serve them this way to guests but for eating ourselves, we like them under-bake. This is a matter of personal preference; if you prefer the cakes fully set, just leave the batter out at room temperature a little longer before baking and keep them in the oven a few extra minutes; you could test it with a cake tester. They're fabulous either way. Are you ready to bid farewell to summer? Where did the time go! I'm sure we're all a bit reluctant to see Labor Day popping up on our calendars but there's also much to look forward to. I figure we'll just embrace the next season and all the new patterns and adventures that come with it. Before summer '15 unofficially closes out, I thought I'd sneak in another ice cream post. I really put my little ice cream maker to work this summer! And while I definitely eat, and make, ice cream all year round, it won't be "ice cream season" anymore soon and the "activity" of going out for ice cream will no longer be such a given. 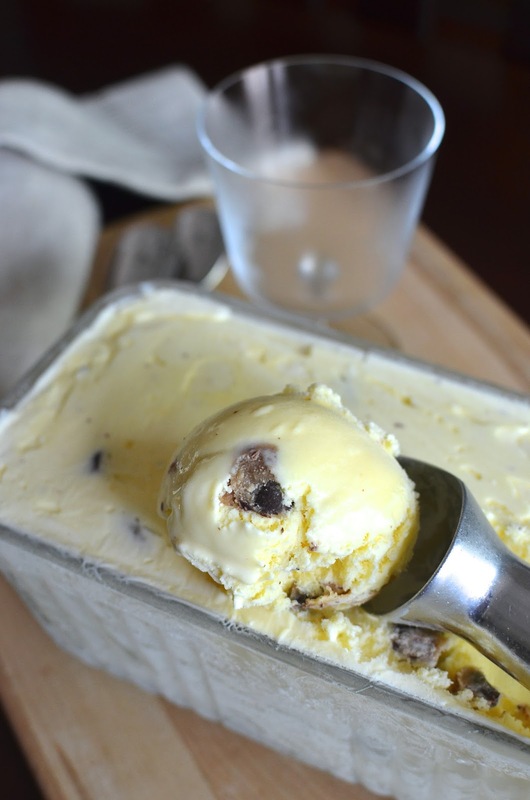 So let's toast the summer with a few more scoops of ice cream - chocolate chip cookie dough ice cream, to be exact! I made this batch of ice cream for my husband (though the little guy probably ate more than his dad). It dawned on me recently that as much as my husband likes cookie dough ice cream, I hadn't tried my hand at making it for him yet. And since I really wanted to, it was time to get cranking! So I started with the chocolate chip cookie dough, following David Lebovitz's recipe from The Perfect Scoop (though I was a little less generous on the portion). Melted butter, brown sugar, a little bit of flour and lots of chocolate chips make for a dark dough studded with chocolate that you cut up into bite size pieces once it firms up. Are you a raw cookie dough eater? As much as I love to bake and eat cookies, I've never been tempted by cookie dough or cake/brownie batter! I guess that might explain why I hadn't made this ice cream flavor before. As for the base, I used Ciao Bella's gelato recipe. It's a creamy custard base that calls for 4 egg yolks, 2 cups of whole milk, and 1 cup of cream. After cooking, I stirred in some vanilla extract in this case. This base recipe is one I use often; it's not too rich or heavy, and it's a great foundation on which to feature other add-ins and flavors. I had some particularly bright orange egg yolks in this batch of ice cream so the base turned out quite yellow! Honestly, it's amazing (and a little scary) how quickly these batches of homemade ice cream have been vanishing from the freezer this summer! This one was no exception and my hubby thoroughly appreciated it. 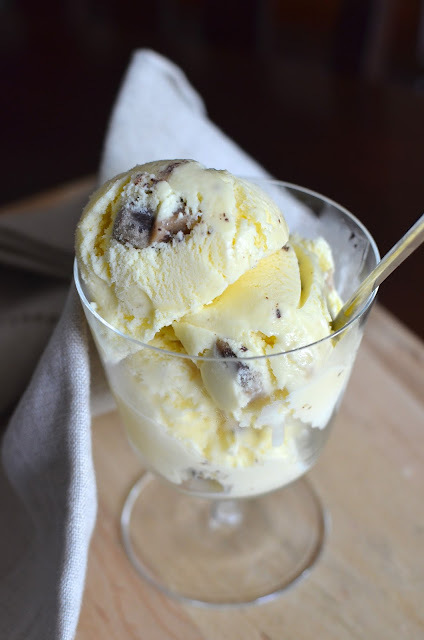 I think I'm going to have to stop this ice cream frenzy soon but even as I write this, I have to confess that I'm taking the remaining cup of cream in my pint to make a batch of cookies 'n cream tomorrow!